This book is a companion to Pip and the Convict. 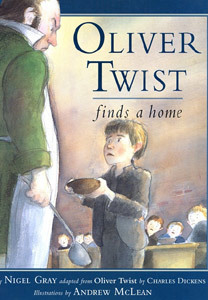 ‘Please, sir, I want some more.’ When Oliver Twist, a half-starved orphan, does the unthinkable and dares to ask for more, his hard life at the workhouse is over. But will his next placement – as an undertaker’s apprentice ­ be any happier? In this retelling of the opening chapters of Dickens’ classic, young readers discover the cruel but colourful world of nineteenth century England as Oliver searches for a new home.